With the groundbreaking ceremony for modernization and reconnection of inter-Korean railways and roads slated for Dec. 26, similar events held more than a decade ago are being remembered. But analysts say that with a shift in circumstances surrounding the Korean Peninsula since, the focus has now moved to “modernizing” North Korea’s railway system rather than “reconnecting” sections of cross-border tracks. “In the early 2000s, it was more about ‘reconnecting’ the railways, but North Korea has shifted its focus now – it seeks to modernize its railway system,” Cho Han-bum, a senior researcher at the Korea Institute for National Unification, said. Seoul and Pyongyang have discussed trans-Korean rail networks since the first inter-Korean summit in 2000. Following the summit, the South and North each held simultaneous groundbreaking ceremonies separately near the inter-Korean border in 2002, signaling the launch of construction on sections of the cross-border railways that were severed at the end of the 1950-53 Korean War. The railways and roads project was halted in the late 2000s amid heightened border tensions due to the North’s military provocations and pursuit of nuclear weapons. Another expert pointed out that the main focus of the earlier railway project was to aid inter-Korean economic cooperation projects, referring to how a slew of train test-operations led to the actual operations of trains carrying materials into the now-shuttered Kaesong industrial park. 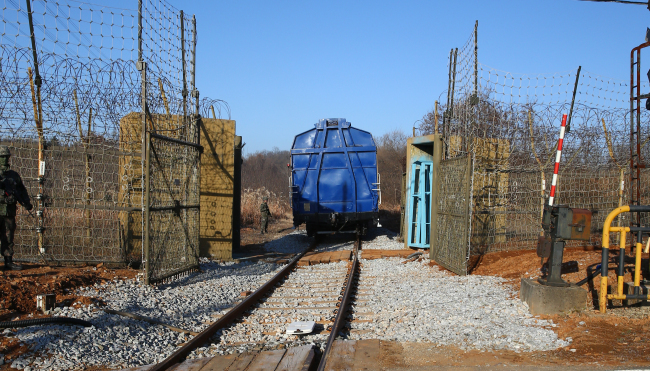 The railway linking the South’s Dorasan Station and Panmun Station in the North’s border town of Kaesong was an active route used to carry materials back and forth across the border from 2007 until border tensions escalated in late 2008. “At the time, aiding inter-Korean cooperation projects and reconnecting a few sections of the cross-border railway were the two Koreas’ goals,” said Yang Moo-jin, a professor at the University of North Korean Studies. “But now, with international sanctions layered against North Korea and Pyongyang’s nuclear issues, the railways project in a sense is being used to keep alive the momentum of development of inter-Korean ties,” he added. North Korea has been expressing avid interest in South Korea’s bullet train system for some time. Earlier this month, a Cheong Wa Dae official under customary condition of anonymity told reporters that there is a “strong possibility” that North Korean leader Kim Jong-un may ride the KTX bullet train during his visit to the South, as expectations were high that Kim’s Seoul visit would materialize by the end of the year. The official also mentioned Kim’s desire to improve the North’s outdated train system as a reason behind his claim. Though the South’s presidential office has since toned down its hopes for an end-of-the-year visit, there remains a high chance that Kim could use the bullet train system during his next Seoul visit. Kim promised he would visit Seoul “soon” at his third summit with South Korean President Moon Jae-in. Kim already vocally expressed his admiration of the South’s railway system during his first summit with Moon in April, referring to his sister’s experience with the train as part of the North’s delegation to the PyeongChang Winter Olympics in February. Observers believe that the train system could be vital in helping North Korea achieve its goal of economic prosperity, with Kim’s declaration earlier in the year to shift his focus entirely to the economy and away from nuclear weapons. South Korea also sees the railway project as a key that could boost trade and tourism, as it would connect the peninsula with international neighbors such as China and Russia. Despite the two Koreas’ hopes, experts say the project faces major hurdles at the moment with little progress in US-North Korea nuclear talks coupled with the dire state of North Korea’s train tracks and unstable electricity infrastructure. Wary of possible sanctions violations, South Korea has been reiterating that the upcoming Dec. 26 ceremony will be more of a symbolic event rather than an actual signal for a launch of construction. “There are talks about North Korea wanting to adopt the South’s KTX, but with the current state of North Korea’s railway system, it would be more realistic to say that they simply want to improve their regular train system,” said Yang. The divided Koreas agreed to reconnect and modernize railways along both the east and west coasts of the peninsula in April. The joint inspection for the Gyeongui Line, which runs along the west coast of the peninsula, wrapped up on Dec. 5, while a survey for the Donghae Line along the east coast was to be completed Monday.